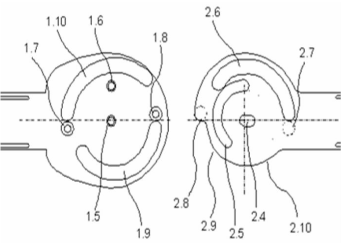 The joint with variable center of rotation has been completed with a series of pins placed peripherally to the roto - translational mechanism . Such pins, once inserted , are free to slide in openings having an higher machining tolerance. In this way each peripheral pin, during the movement of flexion-extension , is able to generate a moment in a precise direction. The example shown in the animation refers to the anterior cruciate ligament whose deficiency produces a characteristic "anterior drawer". The KTJ4 joint by the insertion of the front pins tends to oppose such front sliding to create a moment of strength against the articular laxity presented.